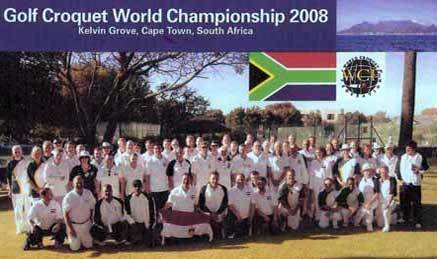 This was the first time that a world croquet event has been played in South Africa. 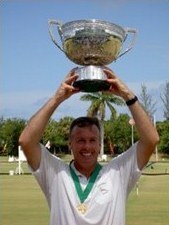 The SA Croquet Association was awarded the hosting of the 8th World Croquet Federation Golf Croquet Championship. The Championship was played from March 8 to 16 in Cape Town and Somerset West. It was centred at the Kelvin Grove Croquet Club, Newlands. Additional matches were played at Rondebosch Croquet Club, Somerset West Croquet Club and Helderberg Village Croquet Club. There were 64 entrants from around the world. The Qualifiers were held at Fish Hoek Croquet Club with its international flags flying beside a newly constructed covered pergola, and the courts surrounded by manicured flower beds and newly laid out raised seating area for spectators which offered a clear view over both courts. Four more South Africans qualified for the Championship – Vernon Tomes, Christina de Vries, William Louw and Clare Stableford. The other members of the South African team were Reginald Bamford, David Boyd, Mike Corcoran, Victor Dladla, Carole Jackson, Peter Johnson and Grahame Tomes. It was a wonderful evening in Cape Town for the final match between Reg Bramford (RSA) and Ahmed Nasr (Egypt) being played out on a smooth bowls lawn at the Kelvin Grove Club in Newlands. Surrounded by spectators willing Reg to succeed, he lost the first two games but recovered form on the third game and won it after executing a coupe of incredible jumpshots. But Mohamed accelerated into the lead in the fourth game and won it, and the match. Final score: 3-1. We were treated to song and dance by the colourful Cape Town Minstrels and after the presentations said our goodbyes over wine and snacks under the shady trees. SABC filmed part of the event and a councellor from the Egyptian Embassy in Pretoria flew down for the occasion, whilst Lord Laidlaw, the main sponsor of the event, presented the trophies.